Rotner follows Hello Spring (2017) with this salute to the fall season. Name a change seen in northern climes in fall, and Rotner likely covers it here, from plants, trees, and animals to the food we harvest: seeds are spread, the days grow shorter and cooler, the leaves change and fall (and are raked up and jumped in), some animals migrate, and many families celebrate Halloween and Thanksgiving. 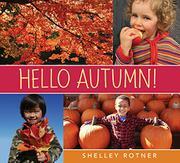 As in the previous book, the photographs (presented in a variety of sizes and layouts, all clean) are the stars here, displaying both the myriad changes of the season and a multicultural array of children enjoying the outdoors in fall. These are set against white backgrounds that make the reddish-orange print pop. The text itself uses short sentences and some solid vocabulary (though “deep sleep” is used instead of “hibernate”) to teach readers the markers of autumn, though in the quest for simplicity, Rotner sacrifices some truth. In several cases, the addition of just a few words would have made the following oversimplified statements reflect reality: “Birds grow more feathers”; “Cranberries float and turn red.” Also, Rotner includes the statement “Bees store extra honey in their hives” on a page about animals going into deep sleep, implying that honeybees hibernate, which is false.